I was first licensed in July 1995, and became an amateur extra class license holder a short time later, my interest in radio is not new however, but dates back to my teenage years. The fascination with radio began quite early. My first real radio was old vacuum tube RCA console from which I would listen to WBZ in Boston late into the night. The idea that I could not only hear and know what was happening in another city, or even around the world ignited a passion that I have to this day, what I like to call the “magic of radio”! 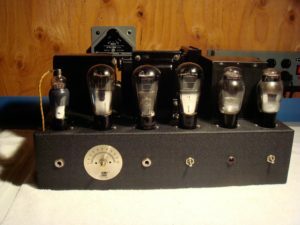 My primary interest is the preservation and operation of vacuum tube ham gear from the 1920s to the 1940s, and much of my “radio time” is spent in the documentation and restoration of such gear. Early prewar gear, often homebrew, holds a special place, as my interests have shifted significantly to favor anything with a black wrinkle finish and glowing filaments. I am a life member of the Antique Wireless Association (AWA), you can find out more about the AWA at www.antiquewireless.org. I am also life member of the American Radio Relay League (ARRL), their web site is located at www.arrl.org. In my spare time, I amuse myself by writing and photographing my efforts, be sure to check my Restorations page to see some my past work, the current projects are listed on the left menu bar. For my efforts on documenting radio history, you find some of my past works at the Written Word page. When I am not restoring vintage gear, I enjoy building building radio kits. I build Elecraft kits at little or no charge for active duty military, handicapped or elderly hams. I will build for others at a reasonable fee. Most of my past builds are located on my Bruce’s Bench pages. Like commercial broadcast stations, amateur radio operators throughout the world are identified by their call sign. Each call sign is issued by the amateur’s government, in the United States the agency is the Federal Communications Commission, and is unique throughout the world. One’s call sign can quickly become more identifiable than one’s own name! I moved to Portland, Maine in January of 2001 and hence replaced the KG2IC call with a suitable old buzzard “W1” call to reflect the call district. 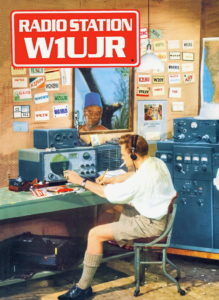 In memory of my elmer, W2UJR, I took the “UJR” suffix. .
Like commercial broadcast stations, amateur radio operators throughout the world are identified by their call sign. Each call sign is issued by the amateur’s government, in the United States the agency is the Federal Communications Commission, and is unique throughout the world. One’s call sign can quickly become more identifiable than one’s own name! I moved to Portland, Maine in January of 2001 and hence replaced the KG2IC call with a suitable old buzzard “W1” call to reflect the call district. In memory of my elmer, W2UJR, I took the “UJR” suffix. I’m always on the lookout for vintage radio parts as well as restorable rigs, mostly early pre-WWII vintage. Please send me an E-mail if you have anything you’d like to part with. 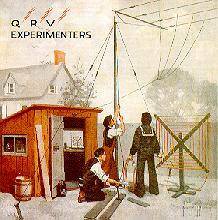 I’m particularly interested in finding high quality home brew ham gear from the 1920/30s, anything by National, Collins, Utah and Gross Radio, as well as an early spark transmitter. Feel free to contact me at W1UJR@arrl.net with comments or questions. Thanks for taking the time to visit my page, I hope to catch you on the air!